In this, my last post honoring World Emoji Day (promise), I showcase the emojis available with Windows Touch Keyboard. In addition to the new emojis in GMail, and the hidden emojis in Skype, did you know that you can access emojis using Windows’ on-screen keyboard? The on-screen keyboard (aka, Touch Keyboard), available to Windows desktop since versions 8, includes emoji characters similar to those used on iPhones and iPads. In Desktop mode, RIGHT+CLICK on the taskbar, point to Toolbars and select Touch Keyboard. The Touch Keyboard icon now appears on the Taskbar. Click (or tap, if using a tablet) the Touch Keyboard icon to display an onscreen keyboard. Click the emoji key to display emojis. Click the desired emoji. That emoji is inserted at the current cursor position. Press ‘X‘ to close the Touch Keyboard when done. In Outlook, click File, then select Options. The Outlook Options dialog appears. At left, select Calendar, then scroll down to the Time zones section. In the Label area type a brief description for the local time zone. Check Show a second time zone. In the second Label area, type a brief description for the second time zone. Select additional time zone from the second Time zone drop down. 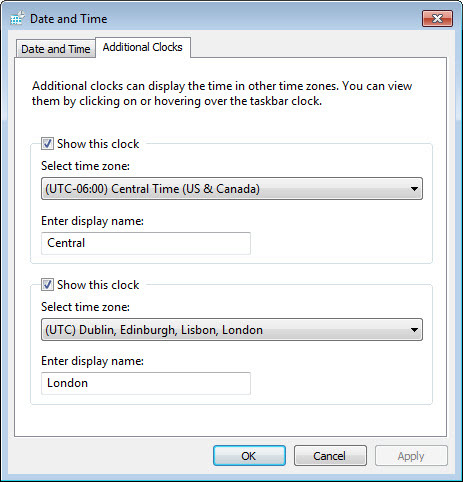 The windows taskbar has the ability to show two additional time zones. RIGHT + CLICK on time displayed in lower right corner of taskbar. For each additional time zone, check Show this clock, select time zone from the drop-down, then enter a name in the field below. For additional multi-regional scheduling resources, visit the World Clock website. There you will find meeting calculators, daylight savings information and interactive maps. The year is 1985. Soviet leader Gorbachev meets with American President Reagan. Cocoa Cola unveils New Coke. Actor Rock Hudson dies of aids. Singer Madonna’s starts her first tour. And on November 20, 1985, Microsoft releases Windows 1.0. Unveiled in 1983, it would not be available for purchase until two years later. 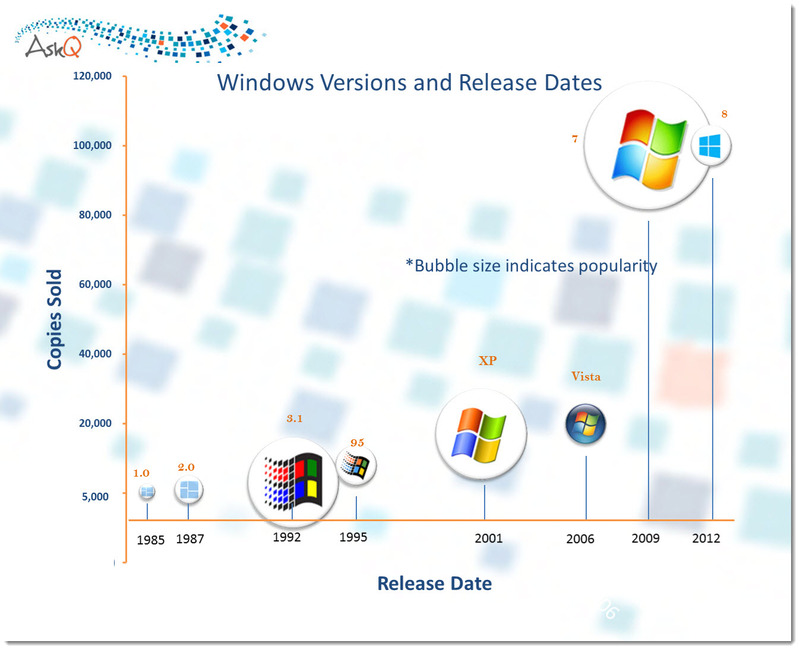 Arguably, that makes Windows 30 years old, but since many tricenarians, have a hard time with that milestone, we extend her two years grace..
Over time her share of sales and public favor has varied, as illustrated by this infographic. Like most twenty-somethings, the Windows logo has had her own experiments with style. Here’s a look back at fashions past. Flashback: notice how similar the current Windows 8 logo is to the original! In honor of Halloween I am handing out treats and tricks! So reach in and fill your bag with this odd collection of operating system tips! *requires Windows 8.1SB (Starbucks edition). Give me back my Desktop and Start Button! Yes, we all complained, and millions of voices could not be silenced. Newer wasn’t necessarily better, so Windows 8.1 has returned some old features and improved some others. The desktop is now much easier to access (yay! ), but the Return of the Start button, misses the mark. START is back, but only as a means to access the much maligned START screen (boo!). The only thing on my Windows 8 Start screen I ever used was the Desktop tile. So going from boot-up to START screen, and then clicking on Desktop was an extra and unappreciated step. Now, with 8.1, you can re-enable booting up with Desktop. To access, RIGHT + CLICK on the Taskbar , and select Properties, Navigation. With Windows 8.1 your Search includes not only your local drive and apps, but also your SkyDrive and web results. And speaking about SkyDrive, there is better integration and support for SkyDrive users. The Windows 8 PC Settings was an abbreviated version of the familiar control panel. With limited settings available, To make a setting change one either had to search for it, or access the legacy windows Control Panel. Windows 8.1 has made more control panel applets accessible under Settings (although I still find it easier to use the search option to locate the setting I am tweaking). The Windows 8 SNAP feature was (sorry) annoying, mostly in that you could not control the size of the windows you were tiling. Windows 8.1 improves this feature by allowing you to control the size of the tiled (oops, I mean SNAPPED) windows. Author quincy harley jrPosted on October 23, 2013 December 3, 2013 Categories Tech, WindowsTags Control Panel, Microsoft SkyDrive, Microsoft Windows, SkyDrive, Start menu, Windows 8, Windows 8.1Leave a comment on Windows 8.1-What’s new?